A tall, shapely and attractive young blonde with good legs and elegant comportment is guaranteed to turn heads wherever she goes. It has always been thus. And this universal truth was demonstrated yet again at the 1959 William Inglis Yearling Sales when a light chestnut filly with flaxen mane and tail stepped gracefully into the Newmarket auction ring. She was a daughter of the first season French stallion, Wilkes, from the outstanding race mare Golden Chariot, bred by John Kelly at his Newhaven Park Stud, Boorowa, northwest of Canberra. Herbert Thompson had raced Golden Chariot, and she had been just about the last racehorse to carry the old man’s colours before he died; Frank Dalton had prepared her on behalf of Thompson and among other good races she won an A.J.C. Campbelltown Handicap. When Golden Chariot was sold at the dispersal of the Tarwyn Park Stud in April 1956 following Thompson’s death, she had brought the top price of 2100 guineas for a broodmare on a bid from John Kelly. At the time she was in foal to Nilo, carrying the future Carrus, who, in due course, would herself prove a good winner as well as a distinguished matron. In the same year that Kelly acquired Golden Chariot, he had imported a new stallion to his stud. Wilkes, a son of Court Martial, had cost just £5,000 sterling and as such would prove to be one of the great bloodstock bargains of the era. Wilkes only went to the racecourse three times – all at the age of three – and he managed to win twice, at Maisons-Laffitte (7½f) and St Cloud (10f). While his racecourse credentials were perhaps mostly untested, his bloodlines were not, as he boasted both Worden II and Mahan, each a winner of the Washington D.C. International, as half-brothers. Golden Chariot was one of the first mares that John Kelly mated with his new stallion in the spring of 1956, and the eye-catching filly on offer at the 1959 Easter Sales had been the happy result. Now, some platinum blondes come cheap, but not this little lady. Bill Longworth was forced to part with 2100 guineas to acquire the filly. High price though it was, it fell well short of the top sum that year of 7100 guineas that Tommy Smith paid for the future Noble Star, a son of the all-conquering Star Kingdom. Nobody knew it at the time of course, but Wilkes was destined to become the stallion sensation of the year, with nine individual winners and £20,490 in stakes; and leading the charge would be this stylish filly of Bill Longworth’s. Registered as Wenona Girl, she was placed in the Randwick stables of Maurice McCarten. Every few years or so if we hardened and inveterate racegoers are lucky, we might experience an epiphany on the racecourse – a moment when we realise with all the terrifying force of divine revelation that we are in the presence of greatness. A fortunate and perceptive few, present at the official two-year-old trials conducted at Randwick later that year in mid-September, enjoyed not one but two such moments. The first came when a striking bay colt named Sky High, prepared by Jack Green, took out the opening heat of the day. A grandson of the illustrious mare Flight, he was a heavy-shouldered, deep-girthed colt, and an altogether more impressive specimen than his older brother Skyline. Like his distinguished relatives, he sported the same blue and orange livery of Brian Crowley. The second moment came later in the morning when Wenona Girl easily won the sixth heat. Almost immediately, discussions began as to which of the pair was the faster racehorse. It wasn’t the only subject of discussion, however. For those whose curiosity about the comparative ability of full brothers to past champions hadn’t been satiated by Sky High in the opening charge of the day, a baldy-faced chestnut might have caught the eye in heat nine. Although he only managed to run second to Gemini Prince, this strongly-built and strikingly-marked son of Persian Book carried himself well above in condition. Like Sky High, he too was homebred, and sported the colours of Jack Mandel, one of the leading bookmakers in Sydney; the colt in question, Persian Lyric, was a full brother to none other than Prince Darius, so unfortunate to be foaled in the same year as Tulloch. The form of those Randwick trials was franked ten days later at Rosebery when in the second set of heats for youngsters, Sky High and Wenona Girl again streeted their opposition while Persian Lyric again found his way into a place. Those two-year-old trials were to be the harbinger of a wonderful season of juvenile racing. On the opening day of the A.J.C. Spring Meeting, Sky High didn’t disappoint his gathering legion of fans when he won the Breeders’ Plate, easily beating Gemini Prince and Persian Lyric. Sky High’s time for the five furlongs was 59.1 seconds and bettered Temeraire’s race record by four-tenths of a second. Immediately after the race, Jack Green declared him to be the best juvenile to have passed through his hands. However, any notion that the temperamental colt might have a lien on the rich two-year-old races later in the season was seriously disabused on the second day of the meeting when Wenona Girl cruised up in the A.J.C. Gimcrack Stakes. Brian Crowley believed that two seasons before he had made a mistake in over-racing Skyline as an early youngster before the colt had properly matured and it was a mistake he was determined not to make with this his younger, albeit stronger brother. Whereas Sky High was immediately set aside until mid-February and not campaigned in Victoria in his first season, Wenona Girl was raced sparingly through the summer, enjoying four easy victories before tasting defeat for the first time when going under to Impulsive in the V.A.T.C. Merson Cooper Stakes – yet another victim of the Caulfield hoodoo that has afflicted so many first-time starters on the tricky circuit. However, the slashing daughter of Wilkes with the long stride atoned for that defeat in majestic fashion a week later when she convincingly won the Sires’ Produce Stakes at Flemington from a field that included Impulsive (3rd) and Persian Lyric (5th). Meanwhile, Sky High remained unbeaten after four appearances on Sydney racecourses, the most recent when carrying 9 st. 5lb in a juvenile quality handicap. The stage was now set for the much-awaited Golden Slipper Stakes when the dashing colt and the flying filly would meet for the first time. Their presence conspired to reduce the number of acceptors for the race to just five, the smallest field ever to contest the event. Sky High dominated the market as a 4/7 favourite while Wenona Girl was available at 5/2 with almost no interest in the other trio. Despite sustaining several bumps and being carted wide, Sky High swooped in the straight to easily defeat the filly by a length-and-a-half in a time that was a half-second outside Todman’s race record. For most racegoers, that seemed to settle the issue of pre-eminence. When the duo lined up for the Sires’ Produce Stakes at Randwick a fortnight later in the first race on the card, Sky High was sent to the post at 11/2 on in a field of four. Not for the last time, the extra furlong and the rise at Randwick upset the odds, with Wenona Girl relegating Persian Lyric and Sky High into the minor placings. The Sires’ race marked the final appearance for the season of the daughter of Wilkes and she retired to her winter paddock as the highest stakes earning juvenile filly in Australian racing history with £16,385, displacing True Course. In her absence, Sky High easily carried the 10lb penalty to victory in the Champagne Stakes later at the A.J.C. meeting to complete his season with earnings of £12,160, having suffered only one defeat in seven starts. When the A.J.C. handicapper Ken Goodwin issued his weights for the Free Handicap, Wenona Girl headed the list with 9 st. 5lb, one pound ahead of Sky High. Lower down the list was Persian Lyric. While the son of Persian Book hadn’t shown the speed of the other pair, his four wins from nine appearances culminating with an emphatic victory in the Fernhill Handicap (1m) with 9 st. 7 lb, suggested that he would be a horse to be reckoned with over the classic distance the following season. Derby Day 1960 was the first in fifty years that no trams transported crowds to and from Randwick racecourse. Exactly eight months before – at 5.30pm on February 1st, 1960 – the last tram to traverse the well-worn loop into the racecourse terminal had picked up its final racecourse passengers for the return journey to the city. The inexorable growth in the use of private motor vehicles had finally crowded out the old ‘toast racks’. Special bus services to the racecourse had replaced the trams insofar as public transport was concerned – a development that some wayward journalists described as a significant gain in efficiency. Often in later years after big race days at Randwick, I have sat gridlocked in traffic queues outside the course and dreamt wistfully of the passing of those old trams. For the curious-minded, some residue of the old tramway infrastructure still lingers on at Randwick like a derelict ghost although few of the younger racegoers would recognise it for what it had once been – a thriving and efficient mass transit system. A field of seven went to the post for the A.J.C. Derby in 1960 with Persian Lyric a warm favourite. Just in the black, Persian Lyric headed Wenona Girl, with Sky High, the only other runner under double figures. How had this son of Persian Book come to dominate the market over his two great contemporaries? All three principals had found their way into the Derby field in just the same three traditional lead-up races viz. the Hobartville Stakes, Canterbury Guineas and Rosehill Guineas. In each race the trio filled the placings, Wenona Girl winning the first and the last contests while Persian Lyric ran a race record in taking out the Canterbury Guineas after making a long run around the outside of the field. 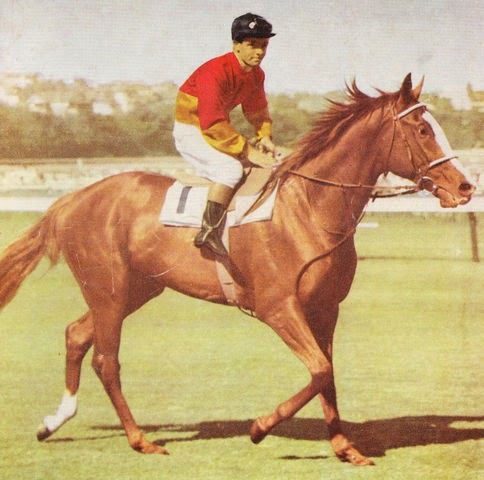 This performance together with his pedigree led many to believe the baldy-faced chestnut held a mortgage on the Derby – that was until his upset loss to the filly in the Rosehill Guineas, which that year was run at Randwick while a new members’ grandstand, the Hill Stand, was being constructed at the suburban course. In the Rosehill Guineas, jockey Ray Selkrig had chartered an uncharacteristically maladroit course on Persian Lyric, having the colt way out of his ground in the early stages of the race, although there were mitigating circumstances. It may seem unduly harsh to sack a jockey for one ordinary ride, but it is an owner’ prerogative; it was a prerogative that Jack Mandel, a difficult man to please, chose to exercise on this occasion. Selkrig, who had been associated with the colt from his earliest barrier trials, came to regard the lost ride as his single greatest disappointment in racing. 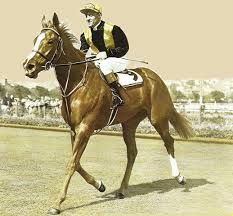 It was in winning the Rosehill Guineas that Wenona Girl convinced McCarten that she was even better than the great Sweet Chime, a filly that he had prepared for the fillies’ classics in the early post-war years. Sky High had lost caste after failing to win in three appearances, each time endeavouring to lead all the way, and many doubted the credentials of this son of Star Kingdom over the classic distance. Although few in number this was a class Derby field in every sense of the word and with Athol Mulley now partnering Persian Lyric, and Jack Thompson and Neville Sellwood on Sky High and Wenona Girl respectively, there was as much quality above the saddle as beneath. An element of interstate rivalry also leavened the contest with Victorian visitors in Cruiser and Reinsman, the latter a colt owned by Bill Stutt and trained by Tommy Woodcock. Queensland boasted a representative too, in Le Storm, out of the former good race mare De La Salle, and he had scrambled in to win a novice at Randwick just the week before. Mulley knew that the favourite lacked the turn of foot of his two great rivals but believed, as the betting market suggested, that he had the wood on them for stamina. The trick then was for Mulley to keep Sky High honest in front and not allow the race to become a sit and sprint affair when either Sky High or Wenona Girl would trap him for speed. “Strategy is the art of making use of time and space,” wrote Napoleon. The same might be said of jockeyship. If Athol Mulley had been asked by the gods to script the perfect run over the Derby course, this was it. When the gates crashed open, Sky High ensured there was no hanging about and going out of the straight the first time had already established a margin of two lengths over the champion filly, with Persian Lyric two lengths further back in the third position. Thompson wasn’t going to repeat the mistake that he believed he had made on Sky High’s grand-dam seventeen years earlier, and the dashing bay colt cut out the first half-mile in 49 ½ seconds and the second in 49 ¼ seconds, stringing out the field over about ten or twelve lengths. Approaching the half-mile, Mulley momentarily moved Persian Lyric forward and is so doing flushed out Sellwood sooner than he might have liked as Wenona Girl raced up closer to Sky High. Persian Lyric remained poised in third place with Mulley biding his time until topping the rise when the jockey gave the horse his head. While Wenona Girl compounded quickly, Sky High exhibited all of the fighting qualities so reminiscent of Flight, before Persian Lyric managed to get past him. It was left to the Queensland gelding and rank outsider, Le Storm, to run on into second placing, with a tiring Sky High claiming third. The race was a triumph for leading Sydney bookmaker, Jack Mandel, who had bred the winner and raced him in partnership with his wife, and their daughter, Mrs H. Abbott. Offered at the Sydney Yearling Sales, the son of Persian Book had, fortunately for Mandel, failed to meet his reserve. I think it was Banjo Patterson who observed: “that in the racing game all men are equal, with bookmakers having a shade of the odds”. Mandel’s retention of Persian Lyric bears out the truth of that observation. Rarely impressive in his trackwork, the Derby winner was a striking chestnut with the laidback temperament that enabled him to stay the mile-and-a-half. In winning, the colt compensated his owners for the bad luck that had dogged Prince Darius, three seasons earlier. A leading figure within Tattersalls for many years, Mandel was one of those purveyors of prices – Jack Shaw and Ken Ranger were others – who extended his association with the racecourse beyond the betting ledger and into breeding and ownership as well. Jack Mandel first registered his colours in 1939 and in March of that year he bought St Andrew, a yearling colt by Gay Lothario, for 700 guineas at the Victorian Yearling Sales. St Andrew proved a more than useful racehorse and as a two-year-old was thought of highly enough to take across to Melbourne for the V.R.C. Maribyrnong Plate. Later as a four-year-old, he strung together a hat-trick of wins for Mandel during winter racing in Queensland culminating in the valuable Q.T.C. Metropolitan Handicap when he beat Abspear by a head. At the end of his racing career, Jack Mandel decided to give St Andrew a chance at stud, and the horse sired a few winners sporting the Mandel family colours. These included Neat Andrew, a Scone Cup winner, and most notably Royal Andrew, who won the 1948 Rosehill Guineas and ran fifth in the Derby of that year behind Carbon Copy. But St Andrew’s greatest distinction at stud was to come from a chestnut mare that Mandel bred from him in 1947 and which he named Lyrical Lass. She traced back to Teppo, that remarkable foundation mare responsible for so many great thoroughbreds in Australia. Lyrical Lass only raced for one season, and that during her four-year-old days when trained by Clem Guy; in seven races – mostly around the Newcastle coalfields – she failed to ruffle the judge for a moment. On paper, she didn’t appear to be the most likely of broodmares despite descending from Teppo. When Mandel decided to mate her in the spring of 1952, it was to a stallion that he had imported into Australia two years earlier to replace the ageing St Andrew. The animal in question was Persian Book, a chestnut horse by Pherozshah, and the winner of five races on English courses including Ascot and Newmarket; he had also managed to run second in the valuable Lincolnshire Handicap, beaten a neck, and fourth in The Cambridgeshire. While Persian Book remained the property of Mandel, the stallion stood at W. Harris’s Holbrook Stud at Kerrabee. The relationship of Lyrical Lass and Persian Book in the breeding barn was to be entirely monogamous and span a dozen years until the death of the mare in December 1964. While their first pairing produced a nice chestnut filly that didn’t amount to anything, the second mating resulted in Prince Darius. After that, the mare missed more than she hit and only ever got three more live foals but the 1960 Derby winner was amongst them. The more I see of horse racing, the more I realise that the maternal side is so much more important than the paternal. When glancing through our Turf history you come across these fine old matrons continually cropping up, many of them of no great account on the racecourse themselves, but of inestimable value in breeding the winners of middle distance and staying horses. Persian Book wasn’t a particularly well-credentialed stallion, but Lyrical Lass just happened to nick with him and produced two fine sons; but for Tulloch, she would have had the distinction of being the mother of two Derby winners. 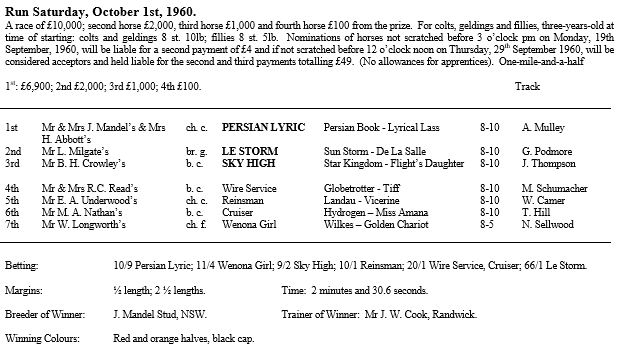 I find it fascinating that Persian Book was a stallion that clearly did nick with certain mares; he only got twelve individual winners of principal races in Australia, and yet half of them came from just three mares. Castanea and Even Better were both by Persian Book from the mare, Spring Frolic; and Jane Hero and Scenic’s Gift were from the mare, Golden Hero. I can’t think of a similar example from that period where a stallion enjoyed such success with different sets of full brothers or sisters at the highest level on the Turf from relatively limited opportunities. The winning trainer of the Derby colt, J. W. (Clyde) Cook junior was the third-generation trainer of a famous N.S.W. racing family. It was Clyde Cook’s grandfather, as we have seen, who trained Woodlands to win the 1877 Derby at Randwick on the occasion of Chester’s famous upset. J. W. Cook senior, Clyde’s father, was successful with both ponies and horses. Among the good ponies that he trained were Lord Liddell and Lady Liddell while in the big league he won a Sydney Cup with Winalot and a Villiers Stakes with his own horse, Wish Wynne. He also prepared Amounis at the beginning of his career. Among his clients were Sir Hugh Denison and James Carr. Sadly, at the age of sixty-three, Joe Cook lost his life in tragic circumstances in July 1941. After catching a Quay-bound tram from near his home in Dowling-street, Kensington, and hopping on a Manly ferry, his body was found by some rock fishermen washed up at Dobroyd Point some eleven days later. Cook, who had complained of noises in his ear, apparently had fallen from the ferry. He left a widow, four daughters, and his son, who immediately took over the Dowling St stables. ‘Clyde’ Cook shared the same initials as his father, and to differentiate the pair, the father early on gave the son his nickname, after a stage comedian of the time. After having been runner-up in the Derby at Randwick with both Conductor and Prince Darius, and having sent out Royal Andrew as a beaten favourite in 1948, it was only fitting that Clyde Cook finally enjoyed success with a horse carrying the livery of Jack Mandel. After all, Jack had been his main stable patron down through the years. The two sons of Lyrical Lass were the best racehorses Clyde Cook sent out from his Dowling St stables in a career that lasted more than thirty years. Clyde’s daughter married the well-known racing commentator, Ken Howard. Persian Lyric was Athol Mulley’s second and last winner in the A.J.C. Derby. While his career continued for many years, disqualifications together with riding contracts overseas conspired to deny him another win in Randwick’s great race. Nonetheless, he continued to provide colourful copy for racing journalists. Whether it was the occasion that he arrived at Hawkesbury when the races were on at Kembla Grange or the numerous instances when he accepted two and sometimes three mounts in the same race, he was never long out of the sporting headlines. His occasional fist fights in the jockeys’ room with George Moore, most notably after the running of the 1968 Frank Underwood Cup, enlivened proceedings on otherwise slow afternoons. The rivalry between Mulley and Moore dated as far back as June 1944 and a protest at Randwick that Moore lodged against Mulley in a three-year-old handicap. The stewards decided that Mulley should keep the race, which didn’t placate George. 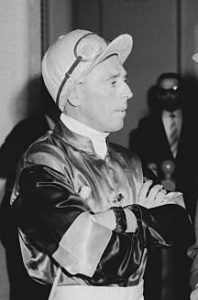 Mulley suffered two serious disqualifications in his life, relating to his ride on Cambridge in the 1956 V.R.C. Australian Cup and Tiberius in a flying handicap at Canterbury in 1961, and a host of lesser charges. His cold and patient style of riding was always bound to attract the attention of stewards. In Frank Hardy’s entertaining book ‘The Needy and the Greedy’, Mulley contributed a few lines. He related the incident at Warwick Farm in June 1964 when he partnered Scottish Soldier with 9 st. 9lb in a welter. In the ring, the horse had blown from 7/2 to 14/1. Mulley wrote: ‘The phone rang at the start and the late Bayley Yates said to me: “Mr Bourke, the Chief Steward, said to tell you that your mount has drifted alarmingly in the betting and he will be observing your ride closely.” I told Bayley Yates: “Tell him he’d better get on himself. Scottish Soldier has been backed S.P. It’s a certainty.” Mulley lifted Scottish Soldier that day to win by a short half head. Persian Lyric’s post-Derby career makes an interesting study. The colt made one more appearance at Randwick at the 1960 A.J.C. Spring Meeting when Tulloch comprehensively beat him in the weight-for-age Craven Plate. Taken to Melbourne he then finished third behind Tulloch and Dhaulagiri in the M.V.R.C. Cox Plate run that year in Australasian record time; Persian Lyric was then sent to the post an odds-on favourite for the Victoria Derby a week later in the hands of Ron Hutchinson, but failed by less than a length to run down Sky High, with Neville Sellwood giving a masterly exhibition of front-running riding. On the eve of that race, Sky High had even suffered the inconvenience of having a veterinarian remove fluid from his near hind hock. In Brisbane, Persian Lyric was untroubled to win the Q.T.C. Derby, again relegating Le Storm into second place. It is highly unusual for the Derby winner to win another race at Randwick during his three-year-old season worth even more than the Derby, but Persian Lyric holds that distinction. The event in question was the A.J.C. Centenary Invitation Stakes, a special £10,000 race conducted under quality conditions over a mile-and-a-half to mark the club’s centenary at the 1961 Autumn Meeting. To stage the race, the club cancelled the running of the St. Leger, which in recent years had been attracting derisory numbers. In a memorable finish, Persian Lyric exacted a measure of family revenge for some of the losses suffered by his older brother Prince Darius, when he lasted to beat Tulloch a half-head, albeit in receipt of 21lb from the champion. Persian Lyric ended his three-year-old season when George Moore partnered him to a surprise win in the Q.T.C. Stradbroke Handicap; Moore’s legendary whistle never secured a more remarkable passage on the inside rails than Persian Lyric enjoyed that afternoon. Moore also partnered the horse when beaten into second place by High Society in the B.A.T.C. Doomben Cup, after conceding the winner 29lb in weight. Persian Lyric struck trouble in that race and afterwards developed a swelling in his near tendon; it was an injury that effectively finished the colt on the racecourse. Persian Lyric didn’t race at all as a four-year-old despite attempts by Clyde Cook to train him, and when the horse did finally resume as a five-year-old, he failed to regain form in five appearances. In the autumn of 1963, Persian Lyric was transferred to the stables of leading Adelaide trainer, Colin Hayes, in one last bid to get the horse back to the racecourse. Hayes was just then beginning to emerge as a force on the Australian Turf and had already enjoyed considerable success with bad-legged horses, thanks largely to the long stretch of beach adjoining his Glenelg stables. But even the magic of saltwater and the Hayes touch weren’t enough to see the baldy-faced chestnut withstand a racing preparation, and the son of Persian Book was, like his sire, retired to stand at the Holbrook Stud, and he was far from a failure. The best of his progeny, Regal Jane and Broadway Boy, came along in his first season. Regal Jane won a Queen’s Cup, Summer Cup and Tattersall’s Cup at Randwick, and at stud was the dam of Lord Folkestone; Broadway Boy won a Newcastle Cup among other races. There were a lot of other useful gallopers in future years as well, and Persian Lyric finished up with progeny winning best part of a million dollars at a time when stakes were much less than today. If Persian Lyric fell short of being a champion, history would confirm that in Wenona Girl and Sky High, the 1960 A.J.C. Derby field boasted two racehorses that fully deserved that accolade, albeit at distances shorter than the mile-and-a-half. In her three starts immediately after the Derby, Wenona Girl won the A.J.C. Flight Stakes, V.A.T.C. One Thousand Guineas and V.R.C. Wakeful Stakes before again failing over the longer journey of the Oaks at Flemington. In the autumn of her three-year-old season against moderate opposition she did finally manage the mile-and-a-half to win the Adrian Knox Stakes at Randwick. Wenona Girl continued to race at her best up to and including her sixth season – a year in which at Flemington she set a race record in winning the George Adams Handicap and a course record in the Lightning Stakes. Always an imposing individual, Wenona Girl won the grand championship award for thoroughbreds when she was exhibited at the 1963 Sydney Royal Easter Show. When retired at the conclusion of the 1964 A.J.C. Autumn Meeting after winning the All-Aged Stakes at her final appearance, her record stood at 27 wins from 68 starts at distances ranging from 4 ½ to 12 furlongs; her stake earnings of £70,825 established a new Australian record for mares, almost doubling the previous marks set by Flight and Evening Peal. Wenona Girl continued to make the headlines even in the breeding paddock. It was Maurice McCarten that insisted on mating her with former stablemate Todman at the Baramul Stud. After all, the pair had shared adjoining boxes for one brief season in McCarten’s training establishment. 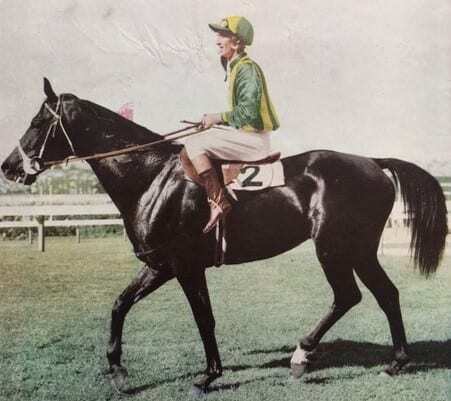 Few sportsmen have forgotten the boom on the first of the champions’ progeny to race – the aptly named Special Girl – and the fevered Melbourne/Sydney parochialism engendered by her famous meeting with Vain in that 1969 Golden Slipper. As distinguished as Wenona Girl’s post-Derby fortunes were, those of Sky High were even more brilliant. Few who were present at Flemington would ever forget his courageous win in the Victoria Derby and the fact that only a week later he was brought back to the mile of the George Adams Memorial Handicap to be beaten a head by Aquanita. For the next two years, Sky High was unquestionably the best horse racing in Australia winning in the top weight-for-age company from five furlongs to a mile-and-a-half and twice setting Australasian records, over nine and ten furlongs. Perhaps the highlight of his career came in the A.J.C. Epsom Handicap in 1961 when he carried 9 st. 2lb to an easy victory. Sky High was retired to stud at the close of the 1963 A.J.C. Spring Meeting having won 29 races from 55 starts for £72,155 in stakes, which at the time placed him only second to Tulloch on the list of Australian money winners. Brian Crowley arranged with George Ryder to stand the son of Star Kingdom at Woodlands Stud, Denman, in the Hunter Valley, serving his first book of mares in the spring of 1964 at a service fee of 500 guineas. Sky High’s retirement marked the end of the line for Brian Crowley and the descendants of Flight on the racecourse. Flight’s Daughter had died in November 1959 after giving birth to a filly foal, who herself died five days later. 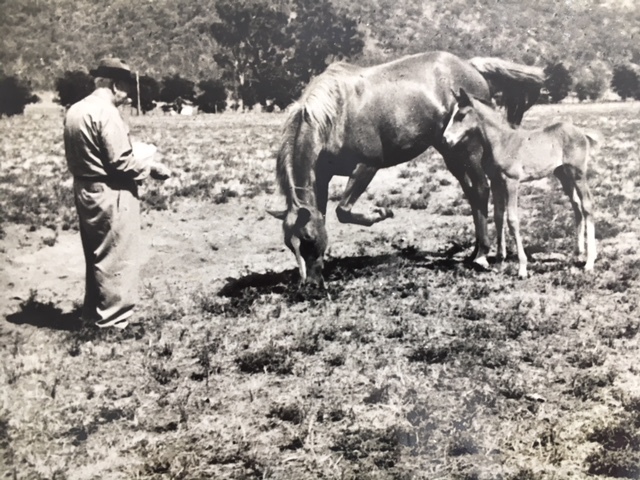 The last of her progeny to make it into Green’s stables was Sky Rocket, a full brother to Skyline and Sky High; the colt was being prepared for the Breeders’ Plate at the 1960 A.J.C. Spring Meeting when he broke a leg in his stall and had to be destroyed. The story of Sky High, the stallion, presents a tantalising tale of what might have been for the Australian breeding industry. He only stood three seasons at Woodlands and from what might be described as modest books of mares, managed to get a few useful horses but nothing remotely approaching his own ability. When Sky High was nine years old, Brian Crowley accepted a large offer from a syndicate of American breeders headed by the legendary Arthur ‘Bull’ Hancock of the famous Claiborne Stud in Kentucky. There the son of Star Kingdom proved his worth as a stallion in just seven seasons getting among other horses, Autobiography, who was named the Champion Handicap Horse in the U.S.A. in 1972; Sky High died at Claiborne in 1973. It was a remarkable coincidence that the two men most responsible for the administration of racing in Sydney during the 1960’s, Brian Crowley and Bill Longworth, each had a champion to carry their colours that came out in the same season. Brian Crowley succeeded to the chairmanship of the A.J.C. upon the retirement of Sir Alan Potter in August 1962 and stayed in that role until April 1974. Bill Longworth, on the other hand, was elected to the chairmanship of the S.T.C. in July 1959 and served until October 1967. To the extent that Brian Crowley’s name became synonymous with a string of good horses sired by Star Kingdom, of which Sky High was simply the most prolific, Bill Longworth’s name became similarly associated with some of Wilkes’ best progeny, even setting aside Wenona Girl. I refer to horses such as Young Brolga, Grammar Lad, Farnworth and Aureo. Alas, while owning a champion racehorse can result in increased popularity and propel an owner on to race club committees, such ownership doesn’t necessarily bestow a spirit of progressive or enlightened administration. While their devotion to the Turf and to the two clubs they served could never be called into question, neither man embraced the challenges of a fast-changing sporting world. The 1960’s were a watershed regarding popular culture and the youth revolution, yet too often the policies of Sydney’s two racing clubs remained snobbish, paternalistic and authoritarian. The result was, I believe, the alienation of a generation or more of young people from this wonderful sport. Racing, particularly after the introduction of the T.A.B., wasn’t a private fiefdom to be administered solely on behalf of a privileged few, but a massive industry. Too often, the clubs’ response to legitimate criticism in the press was reactionary. At the annual Bloodhorse Breeders’ Association Dinner in April 1958, Stanley Wootton had observed: “Jockey Clubs who govern racing are to be blamed for wrongful conduct of the sport. The controlling bodies must differentiate between authority and snobbery”. It was a distinction that the A.J.C. in particular, had difficulty making for many years. Thankfully in more recent years, the club has recognised the importance of engaging with a younger audience although in a sense the ‘horse’ had already bolted.